Live text on the BBC Sport website, live commentary BBC Radio 5 live. Arsenal must keep Luis Suarez quiet if they are to overcome holders Barcelona in the Champions League, according to Gunners boss Arsene Wenger. Arsenal host Barca in the first leg of their last-16 tie on Tuesday. Luis Enrique's side are unbeaten in 32 league and cup games, with Suarez scoring 12 in his last seven outings. "Suarez is the kind of guy who manages to create that spirit in teams," said Wenger, who tried to sign the player in July 2013 when he was at Liverpool. Fellow forwards Lionel Messi, 28, and Neymar are also likely to line up against Arsenal at the Emirates. Messi has scored seven in his last six league and cup appearances, while Neymar, 24, hit the winner in Saturday's 2-1 win at Las Palmas which sent Barca eight points clear at the top of La Liga. 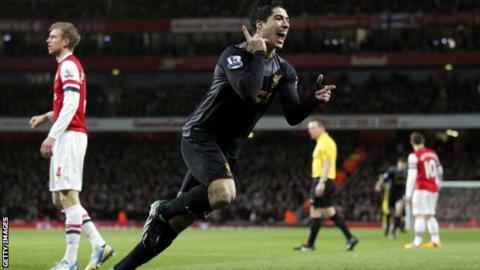 Suarez, 29, is the leading scorer in La Liga with 25 goals and Wenger added: "We have to keep him quiet on Tuesday night. "I believe that apart from the individual talent the three have, they have a good understanding and cohesion." Asked what qualities Suarez brings to a team, the Frenchman said: "Camaraderie. "I believe Suarez gives that to a team. He did it at Liverpool, he did it playing with Edinson Cavani and Diego Forlan [for Uruguay] and did it well. "We have to analyse what we do and do it well and together. "Individually all their players are difficult to stop. We have to find a way to do it collectively."